All summer long, I fretted about these classes. I scanned recipes online, in magazines and in every cookbook I could get my hands on. My selections had to perfectly fill the time slot, be easy enough for a small child, yet interesting enough to please the adult. No small task for someone like me. T hankfully,September’s apple class was a huge success. In fact it was so successful that an extra day of classes needed to be added for the following months. October was pumpkins. Not being a huge pumpkin fan, I had no idea there were so many things you could do with it. Pumpkin cream cheese dip, pumpkin pie, bread, cookies, ravioli…so many wonderful things. Unfortunately, for me…they all seemed to have the same icky taste. 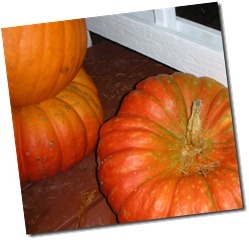 The pumpkin cooking creations wasn’t my downfall…nope…it was the Pumpkin Patch. (Sadly, I never took pictures). 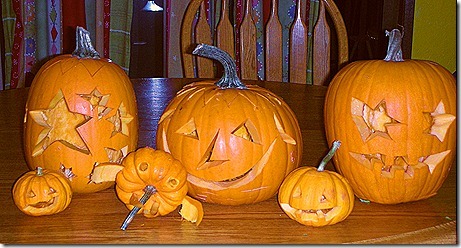 I realized that more than anything, I loved the wonky pumpkins. 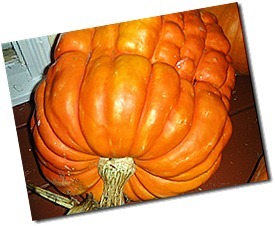 The perfect pumpkins you could find outside every grocery store never did a thing for me. 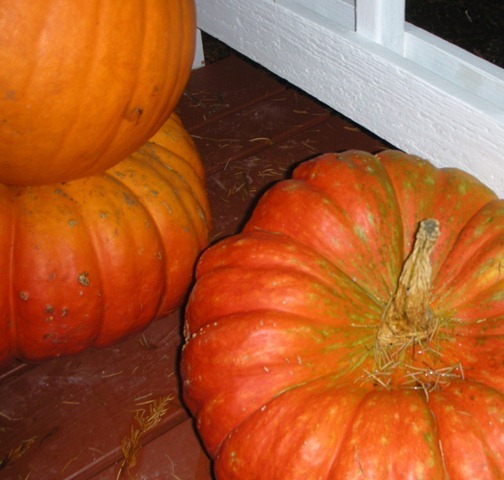 These pumpkins…these natural, warty, funky colored, non-genetically engineered, Charlie Brown Pumpkins…they wormed themselves right into my heart. I had set aside a part of one class for the kids to go out and choose a pumpkin or two from the Pumpkin Patch. Other children from the community were also invited to join in on the fun. Unfortunately, it was pouring rain that day, and the turn out was good, but not great. (You know it’s raining hard when seasoned Seattle-ites stay inside) I was so sad for all orphaned pumpkins that weren’t going to find a home. So…I started to adopt them. I realized that I might have a problem when KT looked at me in exasperation one day and asked me if I knew that I had seventeen pumpkins. (Who goes around counting pumpkins???) I just rolled my eyes at her and decided not to tell her about the four more that were still in the Jeep. 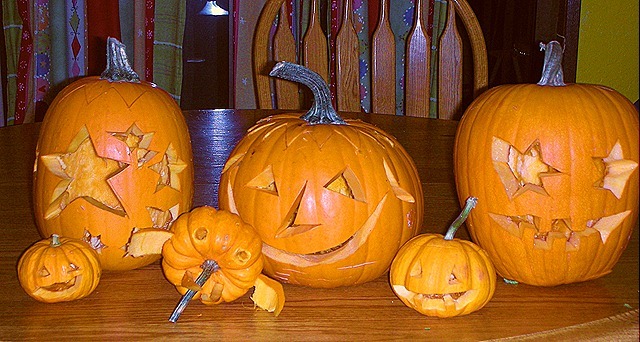 I thought I was very gracious when I sacrificed some of my beloved pumpkins and allowed them to be carved into Jack O’ Lanterns. (Do you see the elephant that Shaun and KT created? I know it’s obvious, but it the small one in the middle) My family was ready for the pumpkins to find a new home after Halloween, but I claimed we needed to wait until after Thanksgiving. Lucky for me (and my pumpkins) that wasn’t until the end of November. Yesterday was the second of December…and it was also yard waste day. 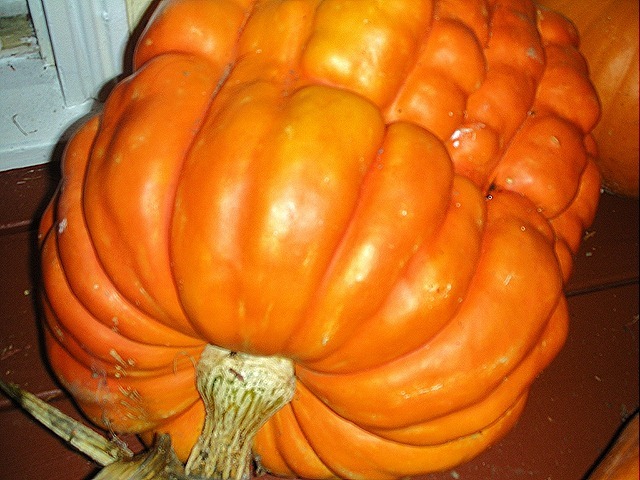 I reluctantly loaded up my poor orphan pumpkins in to the bin and hauled it up to the street. (I really shouldn’t have been too surprised to find that they were starting to rot and mold on the bottom) My poor porch looks so empty and forlorn now. I’m not quite sure what to do for it. Hmmm…it’s December…the only time of year you can get away with a wonderfully gaudy display of lights and tacky displays. This entry was posted in Cooking, Family, Gardening, It's all about me! and tagged Christmas display, pumpkin patch, pumpkins, tacky. Bookmark the permalink. You mean that I won’t be tripping over those ugly orange things on the porch when I come to visit. You always were a sucker for that way begone look! I sadly through out my pumpkins, too. They were pretty icky by now, but I just hated throwing them out. Everything looks pretty empty. I’m married to the Scrooge of outdoor lighting, so I have to rely on overdecorating indoors. One year I dumped all the pumpkin carcasses in the wooded area behind our house. The following spring I noticed pumpkin vines growing up our trees! I harvested about 20 of them AND they looked so funny — pumpkin trees! Do what we Dutch do and put your wooden shoes on the porch. I have an extra pair to loan you! Sweet! 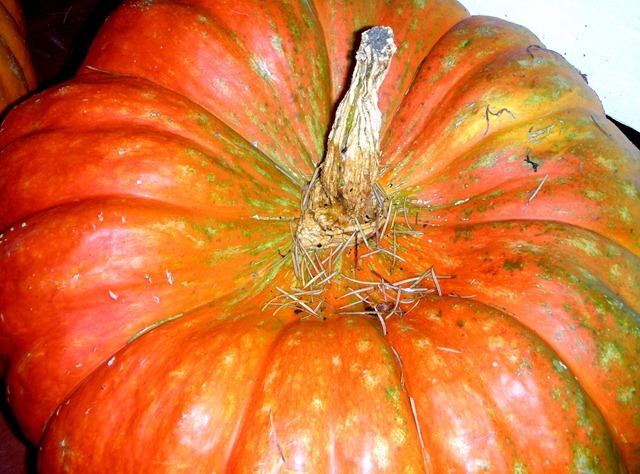 Will the Great Pumpkin come fill it for me? I prefer the wonky ones as well! There is where we part company. I love the smell of roasting pumpkin! 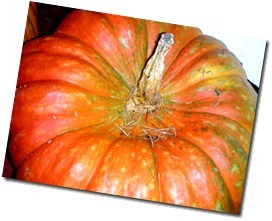 The larger pumkins for carving are useless for eating. They’re too watery and have no flavour. Sadly I can’t get pumpkins in the UK after Halloween. Nobody thinks about EATING them! Canned pumpkin is not available either – but I suspect you’d think that was not a problem. I always have a hard time just dumping my jack o lantern after Halloween. We used to get a few of them and they’d all just stay until they began caving in. Now I only get one.. and get my son to do the dirty deed shortly afterward. 🙂 Fun post! this is my first time to your blog and your have some cool stuff. but how do you make it snow? that is awesome. I totally agree with your love for the wonky ones. They are so beautiful. OK, out with the pumpkins and in with the Xmas decor. SO, where are the next set of photos, hmm?? ?